One of the best things I ever did for myself as an artist was private art lessons. Nothing beats personal attention and mentorship from another artist in your chosen field. I believe this is the most effective way to learn any creative craft, just like you would take guitar lessons to learn to play. In this way, you gain more than just fundamentals and technical masteries. With personal customized feedback you gain insights into your strengths and weaknesses, your creative needs as an artist, and focus on the things that matter to you specifically. This is what I want to offer with this mentorship. 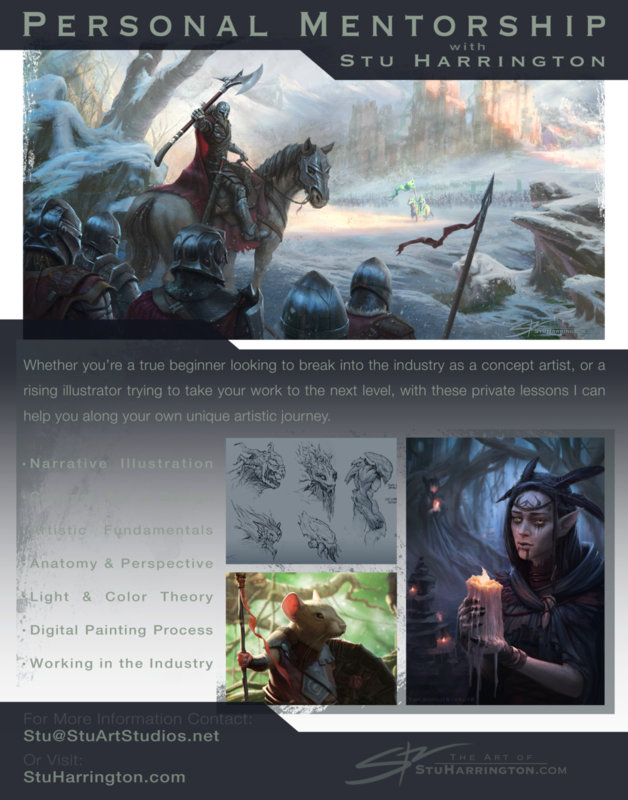 Whether you’re a true beginner looking to break into the industry as a concept artist, or a rising illustrator just trying to take your narrative illustration to the next level, I want to help you along your own unique artistic journey. These lessons will run month to month with affordable rates to allow for sustained study. We will meet one hour per week or more via web. After discussing your personal goals we can set up lesson plans that will help you make them a reality. Submit applications here for review. Please include a brief explanation of what you hope to achieve through this mentorship along with a link to some examples of your work. I will usually respond within 1-2 business days.